Every year for NAB, I’m allowed the opportunity to go and exhibit for Reflecmedia, a company from England that does LED Chroma Key technology. While this limits my exposure to many of the new and exciting products on the floor during the show, it does afford me the chance to catch the AJA and Blackmagic Design meetings on Sunday before the show. This year was a doosie! As I sat with a colleague in the AJA meeting room (which takes place hours before the Blackmagic Design meeting), I voiced to him my suspicion that AJA would be announcing a camera this year. After going through a few of their new converters, the speaker segued into the presentation that would prove me right, and introduced us to the Cion. Upon seeing all of these amazing features (noted below), my friend then turned to me and asked what I thought the price for this body would be. “Under $10k”, was my response, to which he chuckled and guessed closer to $20k himself. Then came the uppercut: $8,995. It’s not often I get feelings like this, and rarer still that I’m proven right in this industry, but I felt this was coming, and it certainly didn’t disappoint. First off, let’s look at the form factor. Both are somewhat reminiscent of the shoulder-mount and ENG cameras of old, but the similarities stop there. The Cion is relatively lightweight, made of quality magnesium with a wood grip and suede shoulder-mount, making for a very natural and substantial feel (And yes, I got to pick it up and try that much out). The Ursa trades this for a sleek design with a large viewfinder that still feels substantial overall, if not quite as comfortable or intuitive. Next, in the big differences department, is the media: Blackmagic Design continues to allow for standard (if new) media, opting for CFast cards. I personally would’ve preferred they stick with SSDs as in the Hyperdeck and Cinema Camera line, but CFast is still relatively new enough (for direct recording media) that it could prove to be a very viable media solution. 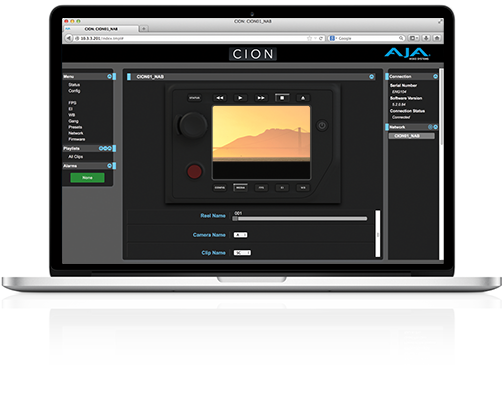 AJA, however, are sticking to their guns and requiring you use their own proprietary drives. This is a double-edged sword, meaning you don’t need to worry about buying some unsupported media or having random failures. However, you’ll need to rely on them for the drives, as well as playback and transfer. AJA makes up for this by using no further proprietary connections (more to follow). “All interface controls are found on the side of the camera facing the operator to provide easy single user functionality. The menu structure itself is elegant and free of cumbersome sub-menu navigation. Confidently dial settings with a robust selection knob that gives clear mechanical feedback as you adjust. This means that instead of running extra monitors to producers, directors, or even editors, you can run it out via network and allow everyone to see what’s going on. Very handy in kitchens with many cooks. One of the best things the Ursa has going for it is one of my least favorite things about it: the large viewfinder. The Ursa uses a 10″ LCD viewfinder, with a 5″ touch-screen control surface. 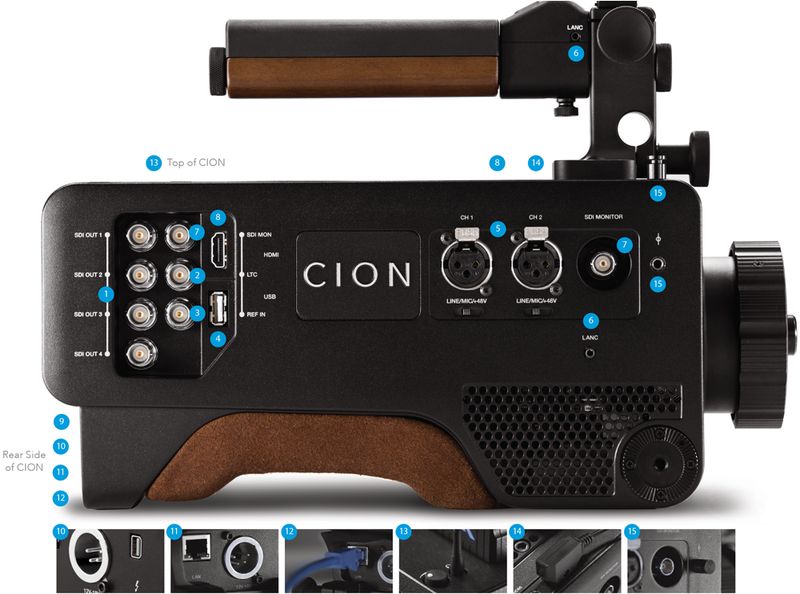 The Cion, by contrast, doesn’t come with an on-board viewfinder at all (not including the small LCD screen on the side), instead offering the option for you to mount your own or simply rely on an external HDMI or SDI monitor. This isn’t a boon for every shooter, but I find it suits my style and set-up best. Remember earlier when I mentioned that the only proprietary requirement for the AJA was the media? This is where that comes into play. Whether you’ve stocked up glass, rails, a viewfinder, batteries (with 4 pin XLR or 2-pin built-in), or just a lot of 1/4 20 mountable accessories, this body is going to allow you to use all of it. The Ursa can accept 3rd part rails out of the box, but requires accessory plates for V-Mount or AB batteries. The main perk I could see for the Ursa is sensor forward-compatibility. Both bodies come ready-to-go with Super 35 sensors, but the Ursa allows you to remove the sensor and replace it in the future as technology advances, which could be huge if this is a big-time future investment. The trouble with this body, however, is that even if you upgrade the sensor, you’re still limited to 10-bit ProRes 422 HQ as your top recording codec, while the Cion can get you that plus ProRes 4444 in all resolutions (except 1080i). So, what does this all mean? Well, it’s still all a matter of preference, as is just about every solution in this industry. 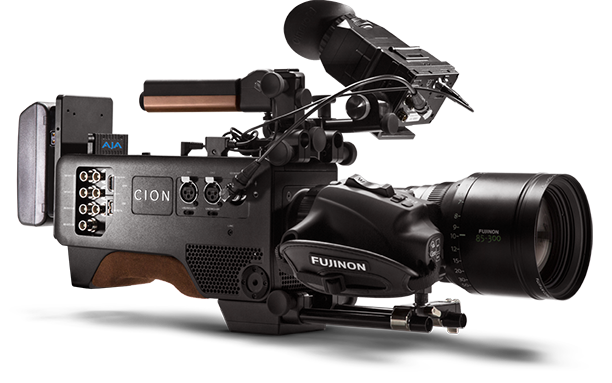 I found that for my needs and style, the Cion is far and away the better solution, and at only about $2.5k more of a price tag. If you’ve already invested a lot in accessories and solutions for say, your Panasonic HPX-500, this is likely what you’d want to upgrade to. The Ursa is still a great camera, I just found the limitations to be ones I’d prefer not to have if I’m going to invest over $6k into a camera body. Blackmagic is, however, becoming very accomplished at designing products for specific needs, such as the Studio Camera and it’s impressive features… so long as you don’t need to record. In the end, I believe this is just the beginning between these two brands, and when brands compete in the film industry, we all win. Prices go down as features increase, and I truly look forward to additional offerings from AJA in this market. Jesse has been helping content creators find the best gear and learn techniques for achieving fantastic video results for over 5 years now. He discovered his love for production in high school, and has translated that passion into a career built on learning and recommending great solutions for film makers.